This assignment is two stars for “too” much fun. Tonight I dipped into the DS106 Assignment Bank to complete my first assignment, in this case Writing Assignment 722, TV Guide Remix. I thought this was respectable low-hanging fruit for The Twilight Zone episodes we are considering this week and I tried each of them on for size. I thought about reality shows, and Extreme Makeover, which seemed like an interesting fit for “The Eye of the Beholder.” I never watched EM so I hoped I could pull enough from my light internet research to make a convincing synopsis. The next challenge would be finding a vintage TV Guide image to work from or to adapt. 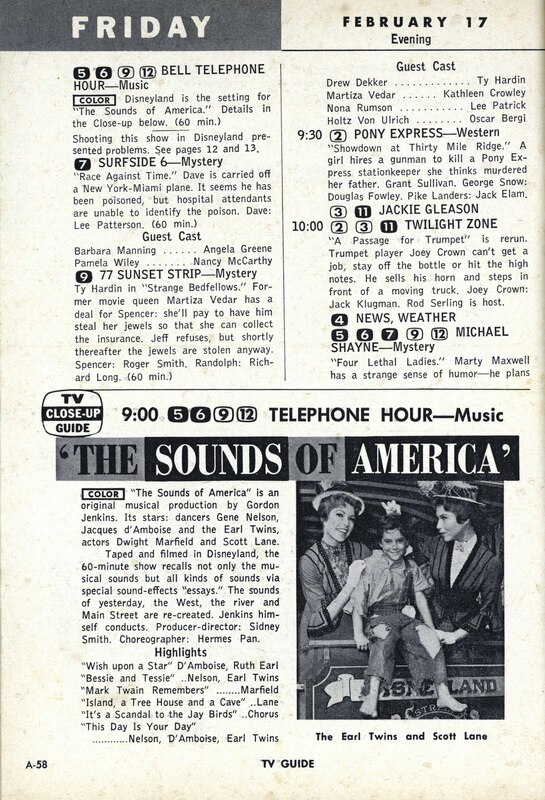 I was able to find a suitable image file by Googling “tv guide vintage listings ‘twilight zone’” and I ended up finding a high quality image that was archived because it included a listing of The Sounds of America which was filmed at Disneyland. In any case, it had my TZ listing, so I was golden. On a side note, vintage TV Guide images of TZ were not too hard to find, however, they were at a very low resolution. I pressed on for a high resolution images because I really wanted to enhance it as Tim Owens did in the assignment 772 details for The Wizard of Oz (which is an excellent piece of work and a high standard to emulate). You can see the low-resolution samples I found here and here and the high-resolution image I went with (curated here by vintagedisneylandtickets.blogspot.com/). Drafting the synopsis was a challenge to keep within the scope of the TZ episode and not overwrite the surprise ending. While it was rare to have images in TV Guide for routine episodes back in the 1960s I wanted to incorporate a visual anyway. I took an image that I thought crossed-over both TV shows: the moment of unveiling. Since I was viewing the original TZ episode in Netflix, I was able to use the Microsoft Windows 7 Snipping Tool to capture the image with a “rectangular snip.” It was dark and moody and I knew I wanted more details to come out so once I imported it into Microsoft Publisher I modified it with +20% brightness and +10% contrast. I set the image aside and then modified the text, font, paragraph spacing and text box margins to approximate the other text of the original image. 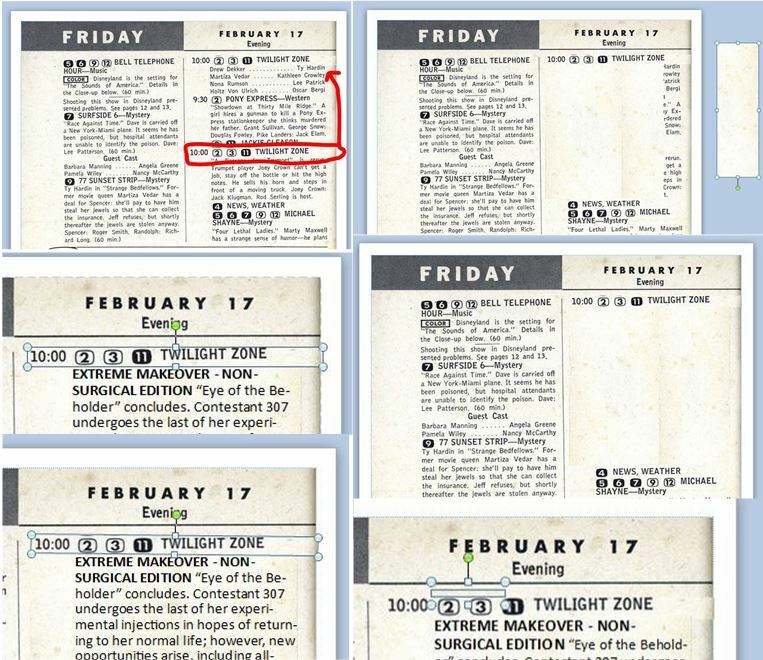 I grafted bits of the yellowed TV Guide page to obscure the listing on the top right of the page and then grafted just the first line of the Twilight Zone listing and set it there. The image was tilted, by less than a degree and so I knew I’d have to address that at some point later. Even the little graft of the TZ listing carried a bit of the listing above it (almost imperceptible) due to this tilt and I intended to smudge that out later. I added more grafts of blank page to the area to create a new canvas and corrected and smoothed with still more grafts. I didn’t fuss too much, hoping I could ultimately smooth it all out with another pass of the Snipping Tool. Clockwise from top left: selecting original listing and copying and relocating it to the top of the page, creating a new canvas with page grafts (shown), and canvas complete; bottom right shows the tiny smudge correction above the channel listings; last two images show the show listing pre- and post-rotation (of 0.5 degrees). Once I had the synopsis in place, I moved in my photo and enlarged and cropped it to get a good helping of the action. I used the Snipping Tool to take one last capture of the new composite and adding a little highlighting over the TV listing for effect. I imported it into Word and applied the Picture Styles tool to obscure any lines in the page from my grafts and possibly to distort any obvious differences between my font (Calibri) and the original font (unknown). I decided to go with the “Reflected Perspective Right” option to make it jump from the page, like a 3D image. The text faded with this option so I had to tweak with -40% brightness, +20% contrast. Before giving it one last pass with the Snipping Tool, I changed the background of the Word page so as to give it a less sterile appearance overall; I opted for Denim to suggest maybe the armrest of a couch in the background. What’s good to watch tonight? Thomas A. Edison is quoted as saying “Genius is one percent inspiration and ninety-nine percent perspiration.” And while I don’t consider this the work of genius, I will say that the conception is but the smallest portion of the time I spent on this work. For those who aim to tackle this Writing Assignment in this manner, expect to spend about 3-4 hours. If you plan to prepare a tutorial for the Assignment Bank, that might take you another 1-2 hours. Still, I enjoyed the heck out of this project and the only thing that could elevate this nostalgia-induced high would be a bona fide Swanson Hungry-Man Turkey Pot Pie because I must have eaten 200 hundred of them from a TV tray on my adolescent trek through the 1970s; a good deal of those meals eaten while watching The Twilight Zone. 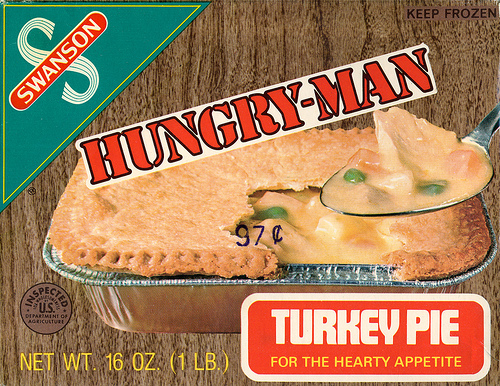 Hungry Man Turkey Pie dinner…”for the Hearty Appetite” (Circa 1970). During spring 2013, I used this blog to host a project I executed for a graduate school course, in which I investigated the practice of a select population through their online activity during a period of time that roughly began in summer 2009 and ended in spring 2013. Specifically, I am referring to those individuals who were using the smartphone app (or companion website) developed by Foursquare to log their regional activities by checking in to venues. 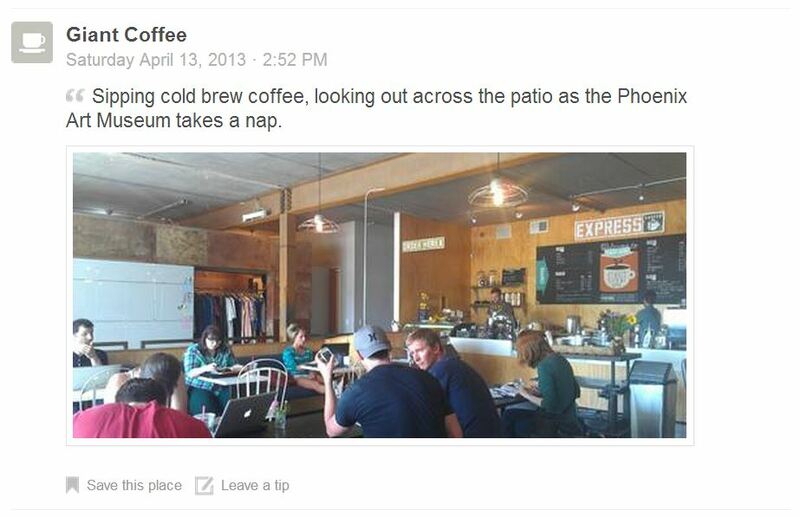 More specifically, I tracked their individual and aggregate activity relative to ten Central Phoenix coffeehouses which Foursquare shortlisted for its Best of project which featured 30 major metropolitan cities including Phoenix. As mobile devices proliferate and geolocation technology pervades our day-to-day activities, online interactions and connections that we used to think of as being the exclusive domain of the desktop computer have given way to more nimble and immediate channels: texting, Twitter, smartphone apps, and synchronized and shared content. How do these channels influence our practices; and how do our practices push these channels to evolve? These questions provide the basis for this sampling of activity within a population that has conducted itself, in part, along one such online channel. While the posts associated with this project have been written to allow for reading in any order, the recommended sequence (if desired) is listed below. They follow in two acts: (1) the context of communities that connect online as well as the use and practice of Foursquare, and (2) profiles of select coffeehouses meant to illustrate some of the major themes evoked by user-generated comments posted to Foursquare. The majority of this work was conducted during March and April 2013. With regard to what this blog is truly about, well, I expect that to change over time. For now, what I’ve outlined above is what is on the menu. Each time this channel gets tweaked or shifts, I’ll endeavor to archive the past here, at the bottom of this page. For now, this is only the first shift away what was intended to be a more regular exploration of online venues during the course of spring 2013. Much of those explorations happened outside the boundaries of this WordPress blog; however, for the genesis of this blog, see my first entry: Adventure Ho! I have always been a sucker for bookstores. So when I pulled up to Jobot Coffee along the hip tranquility of 5th & Roosevelt and noticed an old house with the sign “Lawn Gnome Books,” I was hooked. This sleepy venue had no more immediacy than an abandoned lemonade stand but I could easily sense that I was blind to what it had to offer. Presently, I decided to cross over and open my eyes. I browsed the shelves and discovered that this was, in fact, a local publishing house. During my brief visit, the two staff members — each in separate rooms and on their own laptop computers — simultaneously erupted in smug delight over the just-then published web article in which USA Today declared this very plot of downtown Phoenix (a.k.a., Roosevelt Row) as one of the “10 best neighborhoods that tourists haven’t found yet.” How embarrassing: I was this close to having the entire nation beat me to discovering the gem in my own backyard. Jobot is located in the middle of the arts district and intentionally participates in the synergy of the arts community and local business. There are about five local coffee shops within a mile of this community and Jobot (my interviewee often refers to “we” as a conglomeration of the owners and employees) distinguishes “itself” by being “much more laid back” and a “little gritty” which is “its” way of being honest and unpretentious. 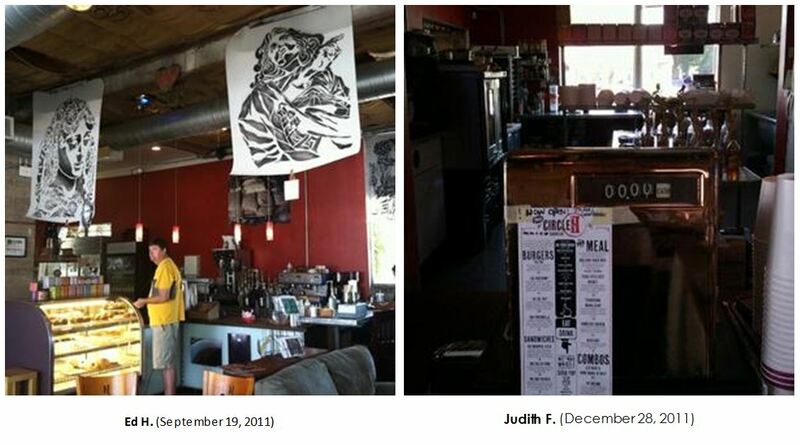 Jobot Coffee cultivates community by participating in events as a member of “5th Street” which has a strong identity and practice of hosting multiple stages and activities during local events such as the monthly Art Walk. During the weekends (when most of these events take place) they are open 24 hours/day. Jobot displays, promotes, and sells local products every day (e.g., shirts and locally roasted coffee from Cartel Coffee Lab). Locals account for about 80% of the client traffic as well as about 80% of return business. Clientele is comprised of students from ASU downtown campus, long-time residents of downtown, and other varied patrons but not many from Scottsdale. Jobot now considers itself more as a café than a coffeehouse but it still maintains “the heart of a coffee shop” because that is how it started, with just a few treats. The food offerings have grown; bake their goods in-house. Their coffee service remains a point of pride. When I told my interviewee that Jobot was identified by Foursquare as a “best of” destination she did not know. When I mentioned that the neighborhood had just been declared an undiscovered tourist destination, this was news. I got the impression that the local “take” meant more than these large, national voices. 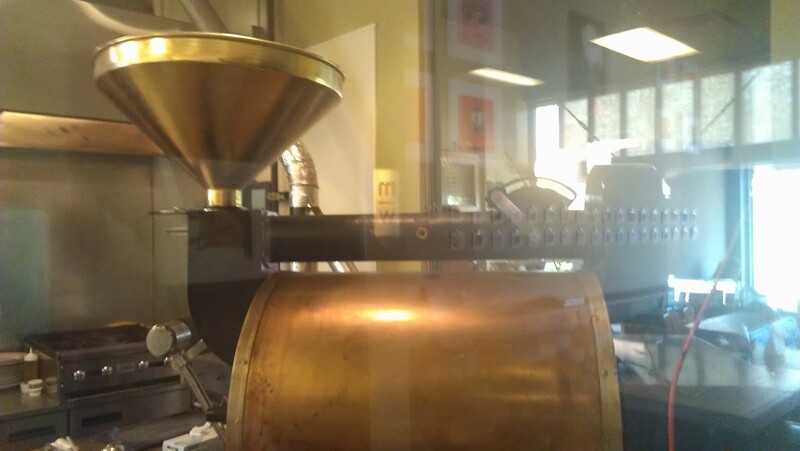 Jobot Coffee has a Facebook page and it is maintained by a core group of current and past employees. Otherwise, there is no online advertising; for the most part their online and offline strategy is simply this: word-of-mouth. I got my food and thanked my interviewee and set myself up in one of the two side rooms. I’m here during the lunch hour and it is active. Everyone is socializing, including the small groups of students at laptop computers, accessing the free, unrestricted wi-fi. It is a young adult crowd; 20s to 30s. In addition to the front room, there are three other areas: the front patio and lawn(seating 42-48), a side room (seating 11-12), and a back room (seating 12). It is in an old house and, aside from the repainted walls (alternating gray-blue and butter yellow), much of the worn look has been retained. All of the furniture is mismatched and suggests that the place is one, large tree house. An old linen closet sans door is the designated bulletin board with four shelves stocked with flyers, posters, and postcards for local venues and events. Artwork is hanging on every wall, even 2-3 items on a wall in some cases. 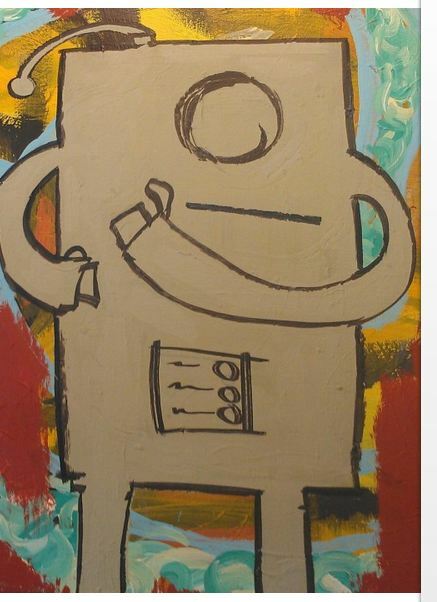 Half the art work is framed; all of the art work features robots. I devour my amazing lunch and leave a tip about it on Foursquare. What isn’t readily apparent from a cursory look at the user-generated tips from Foursquare is the subtext of “place” underlying these remarks. Of the 70 tips left by Foursquare users, 7 (10%) specifically refer to place. 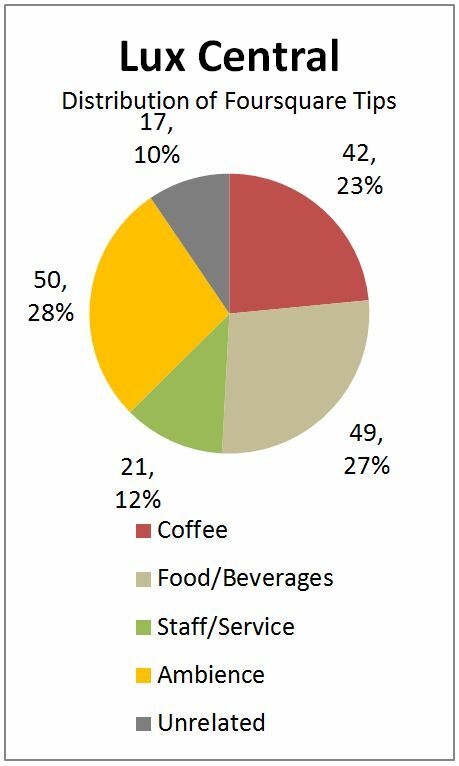 All five of our coffeehouses considered, this is average. However, these remarks also (1) are consistently accompanied with a declaration (i.e., signifying “love,” [goodness], or “best”), (2) usually reference [space], (3) are in no cases accompanied with a directive (i.e., “go,” “get,” etc.) or unrelated content and (4) are generally and concurrently praising the coffee, the food/beverage, the ambiance and the staff/service. In other words, the following seven tips received more “likes” (collectively) and more frequent praise (on average) than any other sampling of place-based remarks for any of the other four coffeehouses in this study. Table 2. For declaratives and other references to “local” there exists a direct correlation; however, for references to directives there is an inverse correlation. These direct and indirect relationships do not emerge when looking at tips with the same criteria for the other coffeehouses. Isolating user-generated tips that reference “place” (in particular, the number of likes on average) suggests that Jobot Coffee clientele affirm their value of place. Click image to enlarge. The above comments have been transcribed verbatim from foursquare.com and are wholly user-generated. What percent of your traffic is local? What percent of your traffic is return traffic? How would you describe the community around this coffeehouse location/neighborhood? 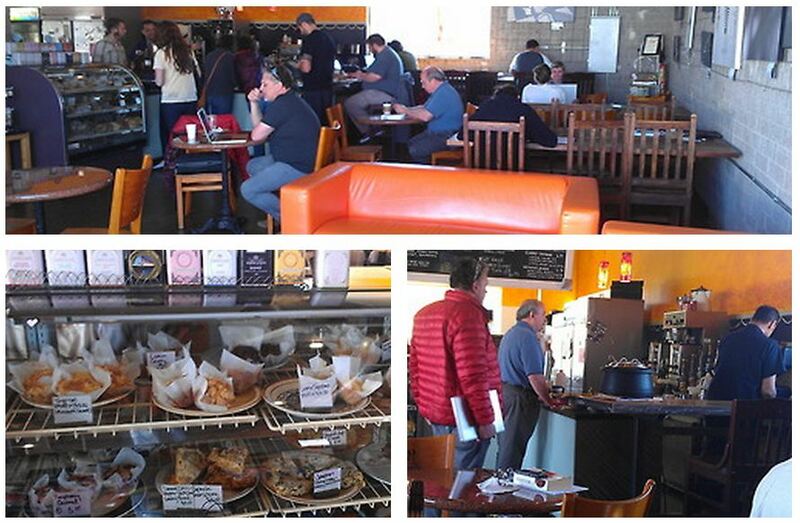 How do you imagine the community (that frequents this coffeehouse) views the coffeehouse? Follow up to #4: Is this what you aim for or do you aim for something else or something more? Knowing that most if not all of your frequent customers and community members spend time online, personally and professionally — what has the coffeehouse done to establish a presence online? Is your strategy for accomplishing “what you aim for” (see #5 above) via online? How do you imagine your community fulfills that “aim” for themselves online? If other online spaces complement the coffeehouse ( i.e., accomplish something the coffeehouse cannot accomplish online) than what do you suppose the coffeehouse affords those online spaces in the “real world” (i.e. offline)? How do you or your staff or regular patrons deepen their connection to the local community online? What would you say for your connection to other local coffeehouse or your network of business owners? Who designed the logo for the coffeehouse? 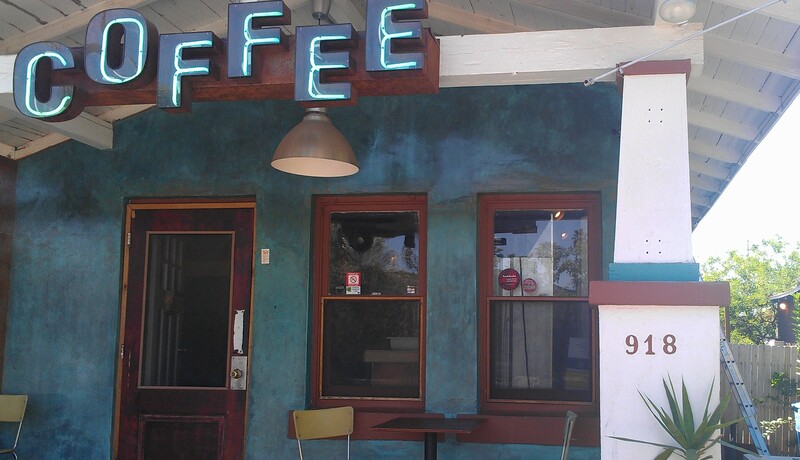 How have you attempted to infuse local elements into the coffeehouse? What effect do you aim for when customers experience these elements? Does it have local art on display? Is there a bulletin board, in one form or another? Is there a logo and what might it suggest? Are there food offerings (i.e., what does the menu suggest about how long a typical visit might be, whether over a muffin or an entire meal). What is on the menu? Consider the location in relation to the city and what is nearby. Is there wi-fi; is it… available, free, advertised, secured (requiring a password)? • Jobot Coffee on Yelp! Lola Coffee is such a wonderfully local coffeehouse that it is located at the intersection of local and local. Nestled into the corner of 3rd Avenue and Roosevelt, this coffeehouse is located within a stones throw of high density residences, historic neighborhoods, the Japanese Friendship Garden, the Irish Cultural Center, the Great Arizona Puppet Theater, the central branch of the Phoenix Library, commerce, medium-density business buildings, parks, churches, restaurants, more homes, vacant lots and an inner-city freeway. A quick glance at this area from Google Maps and you’d think you were watching someone play a game of Sim City. This is the local coffeehouse for brew on the way to work, a cup o’ joe after walking your dog in the morning, a Matador when you go downtown to attend the theater, to discuss business or catch up with friends over latte, or maybe just to step in for a bag or two of locally roasted beans. However, it is not necessarily positioned to host a book club or to cultivate community building. There is a bulletin board which is small and does not appear to be managed necessarily; there is also a low window sill with literature and flyers that seems more like an easement than a part of the coffeehouse. The coffeehouse is comprised of a single room with two narrow bars along the west and south walls, four block tables, a comfy, worn leather couch with two matching chairs, a mix of matching chairs and vintage matching stools, two small tables in the hallway and a single table for six on the sidewalk outside (total capacity is about 40). The indie music is loud; perhaps too loud for so little conversation. On this occasion, I do not observe any younger, college-aged patrons but mostly a mix of professionals and young professionals. People drift in in groups of 2-3 and do not stay particularly long. There is more socializing than individuals working or reading alone. 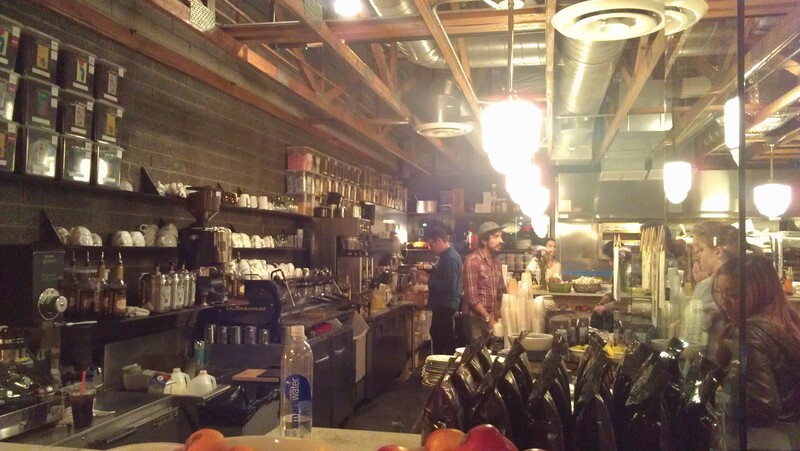 In this large, single-room coffeehouse, with intentionally worn and unrefined décor, amid the concrete floors and industrial and loft-like details, there is a window to the kitchen — occupying almost the central point of the establishment: it is the coffee roaster, as dazzling as a steam punk contraption from the Land of Oz. Where other coffeehouses package community or delicacies or ambiance, Lola Coffee proudly presents the craft of coffee. I spoke with the barista, the lone employee on duty during this sleepy, late Saturday afternoon about Lola Coffee and the community it serves. The clientele is upwards of 80% local and return business is also close to 75%. The pulse of the community is “very local first,” favoring local and quality over fad. They are a loyal clientele who desires what is good — food, coffee, staff, appearance — to not change, to be reliable. The owners strive to deliver a “consistent product.” Lola Coffee baristas participate in regular barista competitions and coffee education events and have even hosted them. While community groups don’t seem to meet here, this comfortably compact space fills during local art walks, marathons, street festivals and on weekend mornings when the “regulars” turn out for omelets, a word-of-mouth attraction. We discuss the current artwork on display and I learn that a single, local artist is featured every three months. I look at the inspired menu board suspended above and it occurs to me that the menu board must be to the coffeehouse what the signature is to a person. 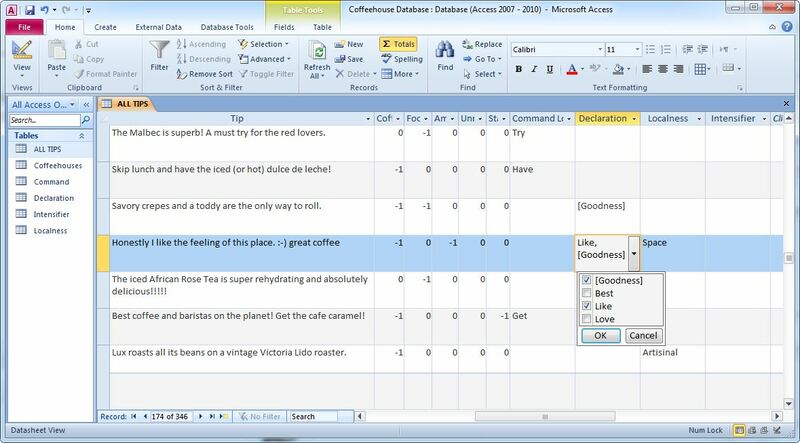 Since I observed that there were significant Lola Coffee tips associated with coffee over the other topics, I chose to see what correlations might be observable if I filtered for user-generated tips that used intensifiers; i.e., exclamation points, ellipses, and using “I,” “my,” or emoticons. In the first chart we observe the percentage of tips that used intensifiers or were otherwise “enthusiastic.” This is like saying “okay teams, show us your spirit!” Some patrons are more enthusiastic than others (see the gold bars) and we see that patrons of the Lux are most enthusiastic with 67% of their tips being intensified in one way or another. Next, we ask ourselves, what are they cheering about? 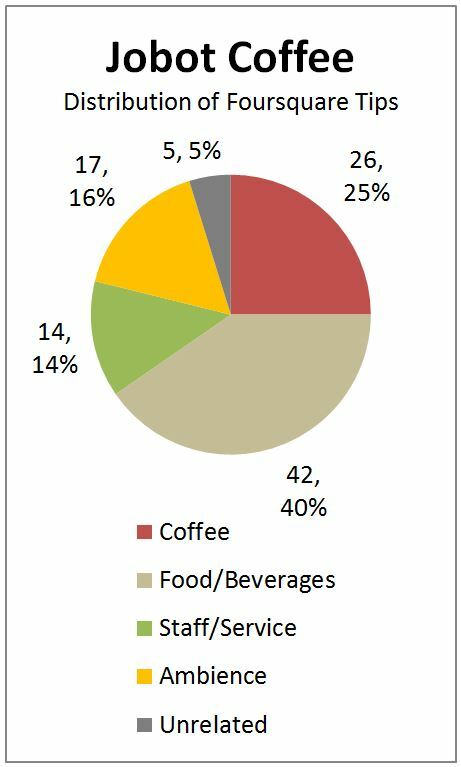 In this chart the blue bars represent the percentage of enthusiastic tips that are coffee-related. Consequently, the majority of the enthusiasm that Lola Coffee patrons express is about their coffee as opposed to other qualities, such as food, ambiance or service. If we look at which group of enthusiastic tips about coffee get rewarded (or affirmed) with “Likes” we see that both Lola Coffee and Lux Central are most affirmed and by a significant margin. 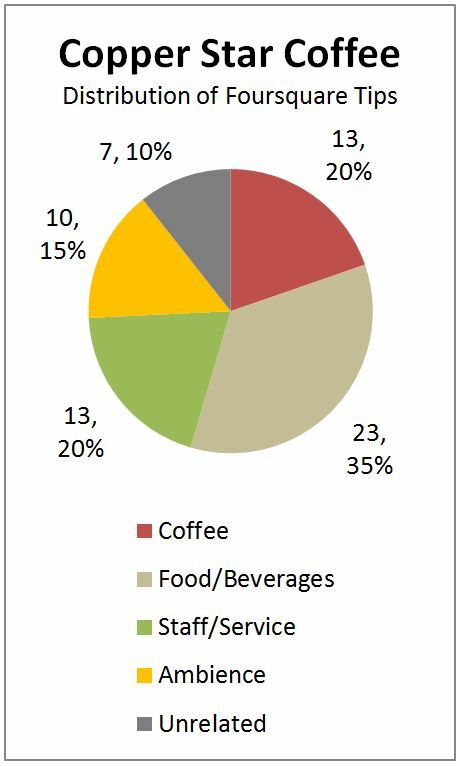 Top left: Percentage of enthusiastic tips, in general (gold) and specifically about coffee (blue); bottom left: percentage of “likes” that enthusiastic tips about coffee received; top right: distribution of enthusiastic tips about coffee among other verbal elements; and bottom right: redistribution of the previous chart. Click image to enlarge. • Lola Coffee on Yelp! As I settled into the tall, padded booth running along the length of the south wall I thought about how Giant Coffee was a bit of a contradiction: on the one hand it was the coffeehouse space I liked the most but on the other hand the vibe was all wrong. The crisp décor combined industrial and organic elements, with splashes of color in earthy tones; all illuminated by the indirect light pouring through the west end of the room — an entire wall of glass folded up and out of the way to simply erase the division between inside and outside. This was a delightful exhalation; this was a morsel of Zen. And yet, there was little about this large, single-room “slot” in Central Phoenix, populated by solitary working professionals and students, that made me feel welcome or even present. Which leads me to acknowledge the dichotomy of why I go to a coffeehouse in the first place: to conduct some manner of work or diversion alone and yet in a space that is buzzing with other people engaged in conversation. When I lose focus or momentum in my own work, the enjoyable pastime of people-watching is always on tap…or it is in most coffeehouses, but not Giant Coffee. Giant Coffee is located within a celebrated mixed-use space  just off the intersection of McDowell Road and Central Avenue and the light rail McDowell Station. It is tucked in, across from the Cancer Survivors Park , halfway between the Phoenix Art Museum and the Burton Bar Central Library. This is a prime Central Phoenix location that attracts both young urban professionals and students from nearby Phoenix College and ASU’s downtown campus. With space at a premium, the coffeehouse hall is structured like a cafeteria with four long benches crossing the length of the room from east to west: first, a low bench with four small tables; a long table running down the center of the room with benches on either side; and then a high bench with another four small tables (total seating capacity: approximately 32-40). With the entire west wall open, the wide entrance/patio sports four lounge chairs. Hip, independent music plays at a volume level that would normally compete appropriately with the din of the crowd, but this is a no-noise crowd. At least 90% of the customers are completely engaged with their laptops or tablet computers with a few working smartphones also or instead. The wi-fi is free but the password is not posted; also, there are only two coveted outlets. Less than 10% (perhaps two pairs) are interacting even though it is apparent that several people have come in pairs or perhaps small groups. It is possible that the negligible interaction is attributable to the fact that in a single, large room without nooks or alcoves almost anything that is said by one mouth will likely be heard by all ears. Naturally, this is not conducive to or inviting of interactions and socializing. This begs the question: does the space evoke this anti-social behavior from its clientele or rather, do people who are inclined towards solitary work and little-to-no distracting socialization seek out this space? 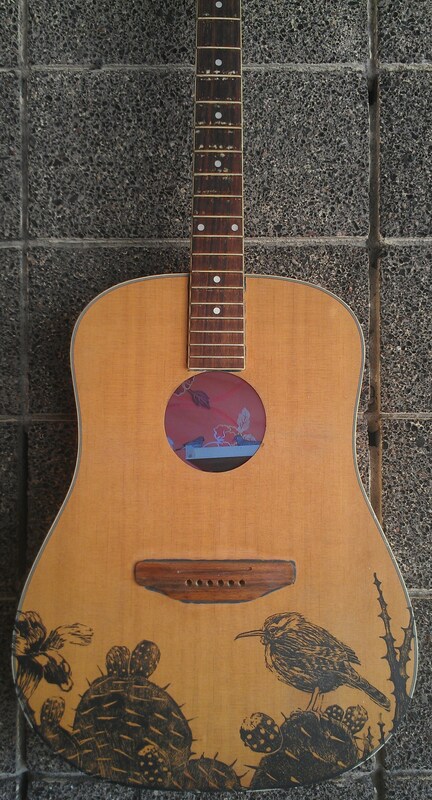 There does not appear to be any local art on display but rather two odd pieces on permanent display: a medium-sized “classic” painting with a gold wood frame and a guitar with a video screen embedded in the sound hole showing a video loop of birds. There is no bulletin board or venue for locals/regulars to exchange information. Giant Coffee does not have a Facebook page but it does have a Twitter account managed by the owner. 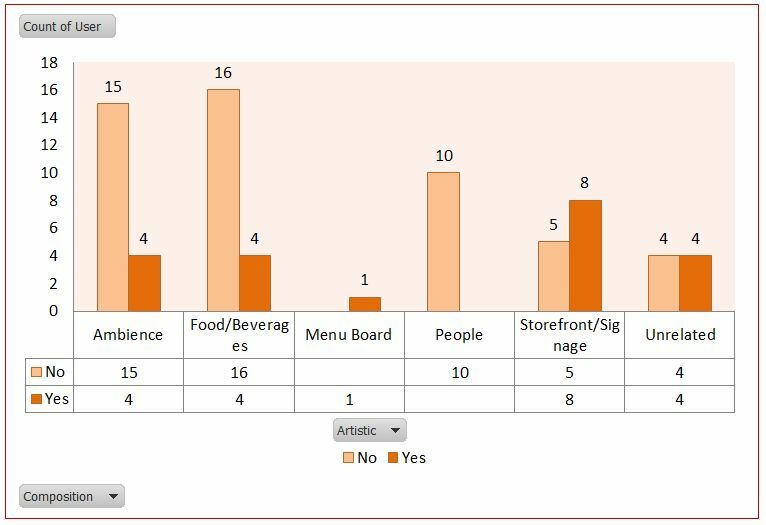 In approaching the user tips for Giant Coffee, I was immediately drawn to those addressing the topic of staff/service because they were considerably overrepresented based on the overall data set of the five coffeehouses. I began with teasing out the elements I’ve coded to compare tips about staff/service against those that were about other topics. Since tips can address multiple topics, those that addressed no staff/service totaled 26, whereas the total number of tips that incorporated elements from these other topics totaled 49 (See the Table 1 below). It is possible that a venue that does not necessarily cultivate or thrive on community would have fewer comments about localness. 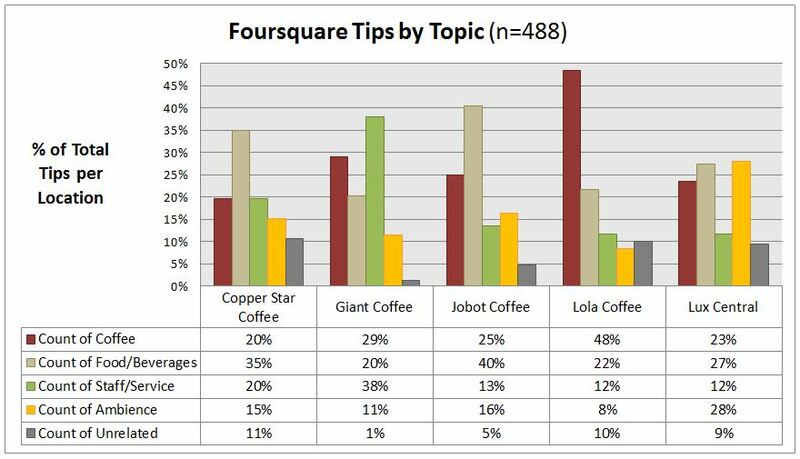 This is validated by referring to the table and charts regarding local- and place-based tips from the Jobot Coffee post. The increased user feedback regarding staff/service coupled with the low user feedback regarding community and localness, places greater emphasis on these remarks. 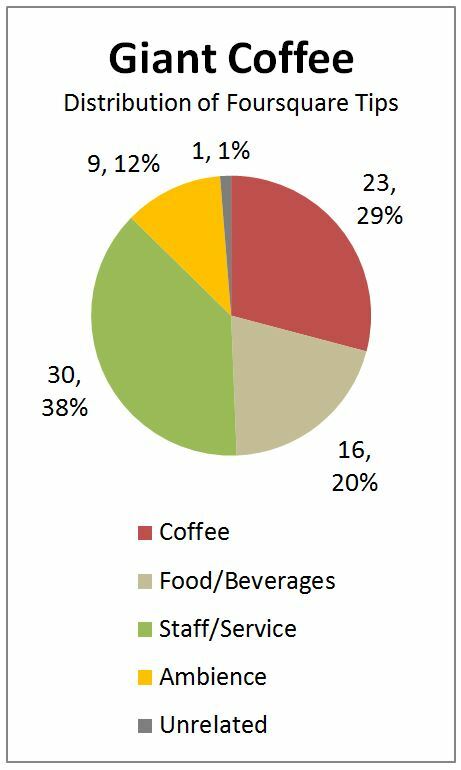 Generally, the data suggests that tips regarding staff/service are proportionately distributed across the other topic areas, i.e., regarding coffee, food/beverage, and ambience. However, when viewing these staff/service tips across coding elements, it is apparent that tips regarding staff/service are much less declarative (which makes sense since these elements are typically associated with coffee and food/beverage) but also much more intense, which can be negative or positive (complimentary); and yet, there is an overrepresentation of tips regarding staff/service under the code for critique. This practice of balance was offset by three other criticisms (see below) that were simply critical and yet oddly resigned to the source of disaffection. Thus, in all six cases, a remedy for the critique is not sought or advanced. Thus, they act — as a user tips are intended to act — as simply a warning sign for those who come along; not to affect change but to say something to fellow travelers about the territory. Of the user tips that were coded as being emphatic (i.e., using intensifiers), eight remain that have not already been discussed. Seven of these tips use a single exclamation point which effectively highlights them without granting them too much importance. The last remark contains ellipses which effectively show that the user is trailing off, having posted questions to the coffeehouse through Foursquare, understanding probably that an answer is not coming. It makes one wonder if this user was in the coffeehouse when submitting this “tip.” Possibly, they didn’t feel welcome to ask the barista at the counter. Four of the “tips” reference the availability of debit/credit service at the coffeehouse. Another encourages patrons to make a purchase to sustain the use of free wi-fi; still another announces that free coffee is available for the second anniversary. These six tips are offering insider information which can be helpful (if coming from a sincere patron) but may also be overtly commercial (if they are coming from an employee or agent of the coffeehouse). It is worth noting that these four tips regarding debit/credit service received 21 Like votes, which is more than twice the average number of Like votes for all tips at Giant Coffee. So, regardless of who submitted the tips, the patrons have validated them. This leaves just one last emphatic tip about staff/service and it is regarding the “pour over” option. What is interesting about this remark is the use of “you” which comes up in other user tips because it suggests that the writer is on some level imagining the recipient of their feedback. User-generated tips are more emphatic and also more critical with regard to staff and service-related feedback. Click image to enlarge. 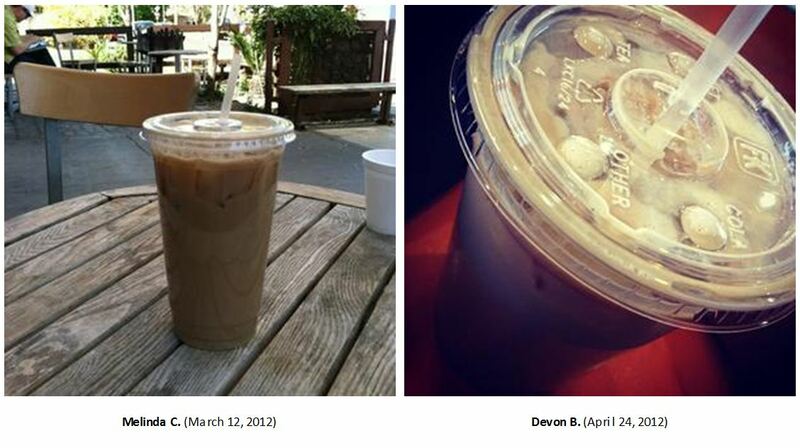 • Giant Coffee on Foursquare for user-generated tips, user-uploaded photos, etc. In my next five posts, including this one, I will examine the data set of Foursquare user tips more closely. 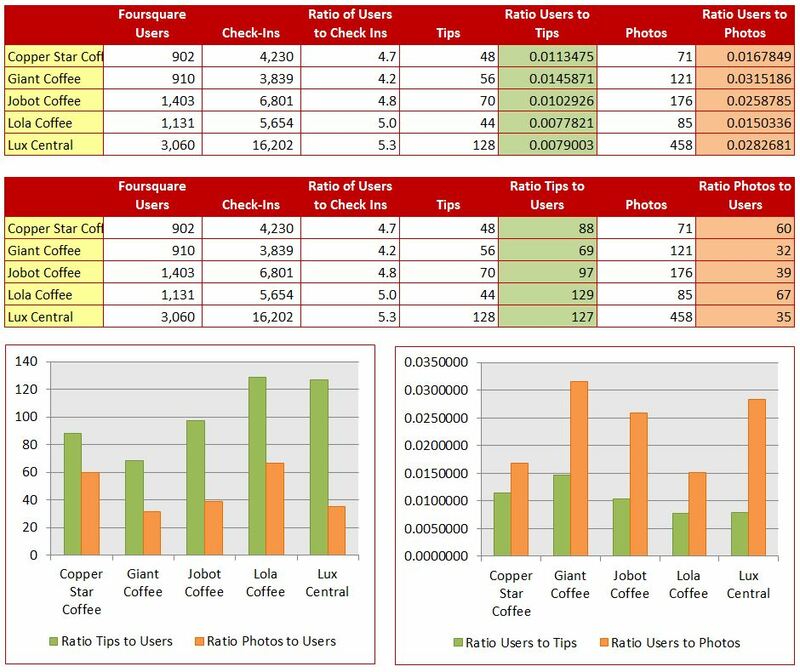 Since the data set for Copper Star Coffee and Jobot Coffee have a similar distribution, I will focus my analysis for this coffeehouse on user-generated photos for all five coffeehouses in general and Copper Star Coffee in particular. Foursquare allows users to check in to venues, leave tips, and submit photographs. It is probably not surprising to observe that the highest number reflects venue check ins and then, decreasingly, the number of unique visitors to a venue, and then the number of tips left and photos taken. In examining the last group, it is clear that, on average, more than three times as many photos are submitted than tips. 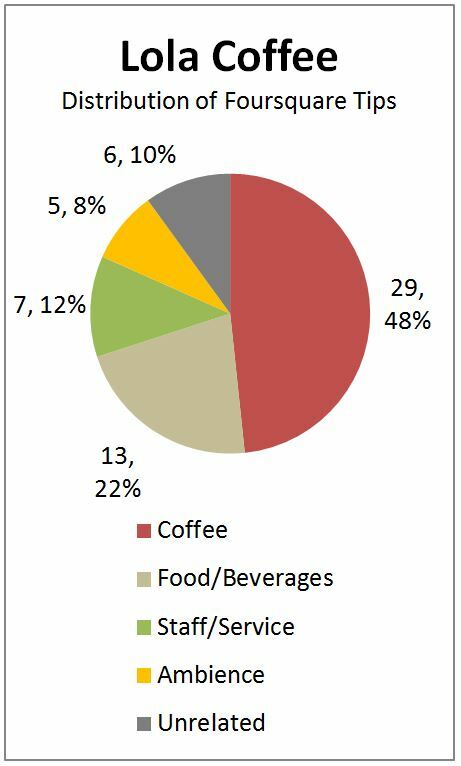 For the five coffeehouses being explored in this mini-ethnography, Foursquare users have submitted 911 photographs but only 346 tips. Certainly, there are obvious reasons for this. However, when we consider the robust online communities associated with Flickr, Panoramio and other photo-sharing sites, it suggests that these user-generated images are, at least in part, intended to be shared and to convey information about their subjects (the coffeehouse and the photographer) and not just intended as a personal photo album. 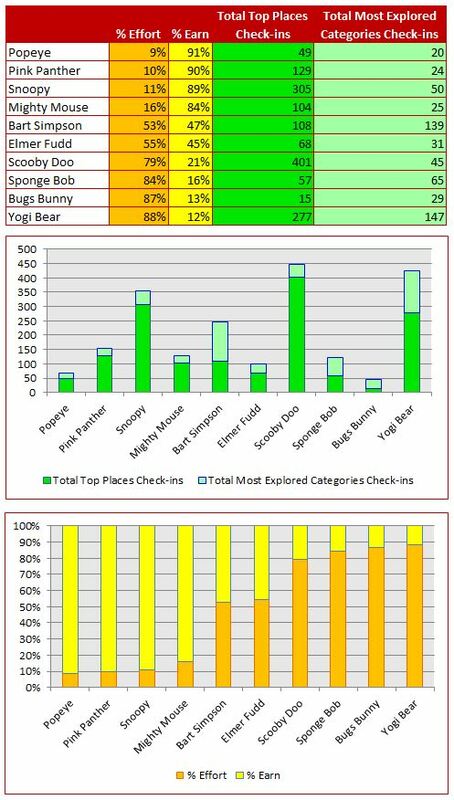 Top table and bottom-right chart: reflects the number of tips and photos submitted per user. Bottom table and bottom-left chart: reflect how many check ins occur, on average, before a person submits a tip or uploads a photo. Click image to enlarge. Foursquare hosts a profile page for each venue and allows users to browse user-generated tips and photographs, among other information. 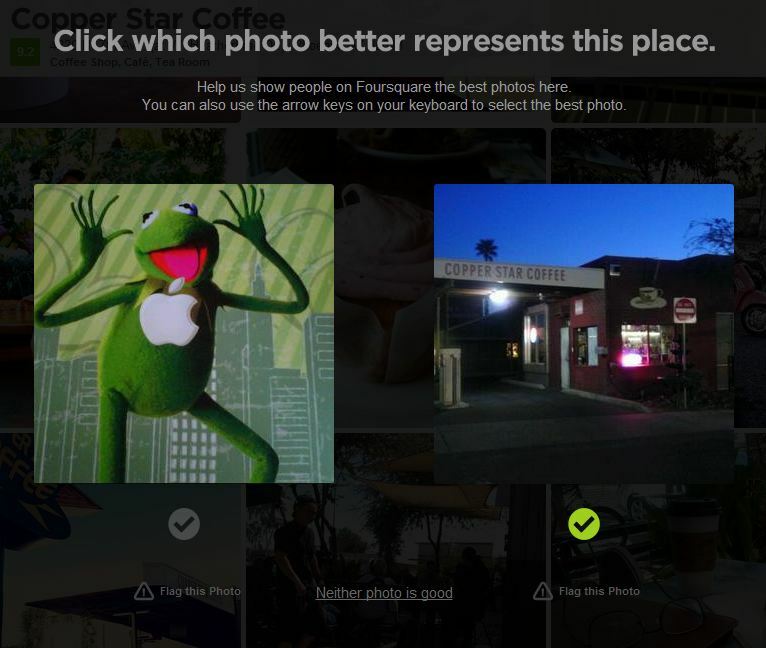 I used this feature to access and examine the user-generated photos for Copper Star Coffee. 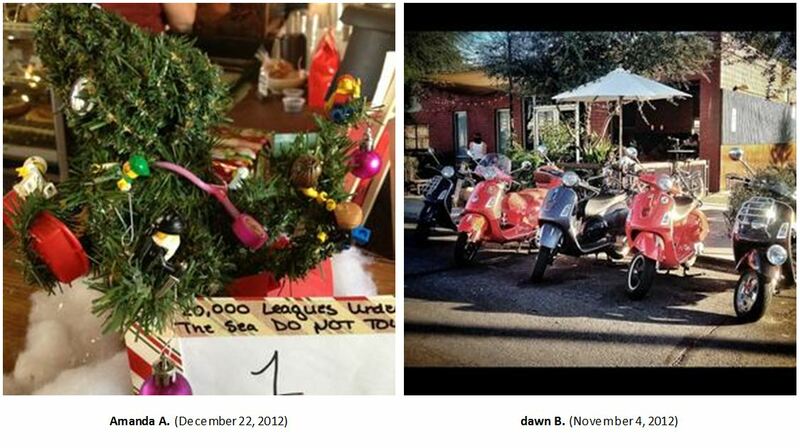 Using the same coding that was applied to user tips, I have coded the photos. Additionally, I have added a further distinction and divided them between “artistic” and “non artistic” images. Of course, this is a highly subjective distinction; and only mitigated by the fact that the same person (me) is evaluating all pictures and at one sitting. The criteria I applied to this distinction was whether or not some additional effort was apparent in the composition of the photograph, in terms of lighting, angle, color, and arrangement. The essence of this distinction is that when a person aims for a more artistic image, they are investing themselves just a little more; they are, in a sense, bringing a greater intention to the task. Under this “gut rubric” I observed that, for this sample, approximately 30% of the 70 photos were artistic (i.e., more intentional) and that subject of these photos were predominately and evenly split between the setting and the food/beverages. Approximately 25% of these photo subjects were rendered artistically. Users also submitted photos of other people and none of these were rendered artistically. Finally, and more important to Foursquare (see image below), is that users submitted photos of the storefront and these were, on average, rendered artistically more often. 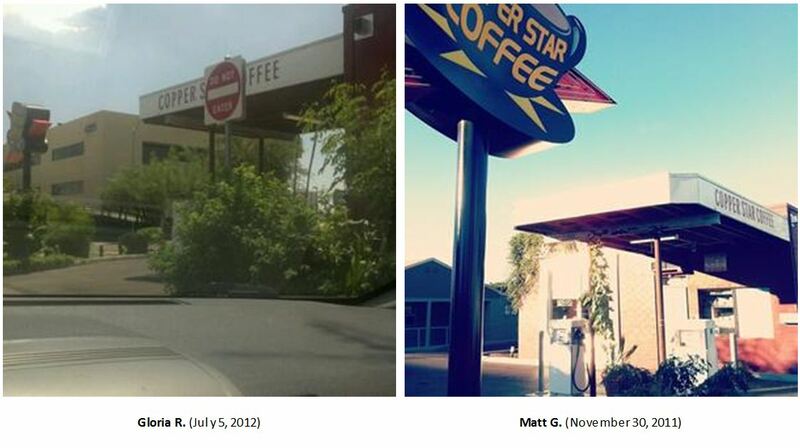 The following gallery illustrates samples of user-generated photo submitted to Foursquare for Copper Star Coffee. Images deemed more artistic are on the right and they are in the following subject order: ambiance, food/beverage, storefront, and unrelated. • Copper Star Coffee on Yelp! 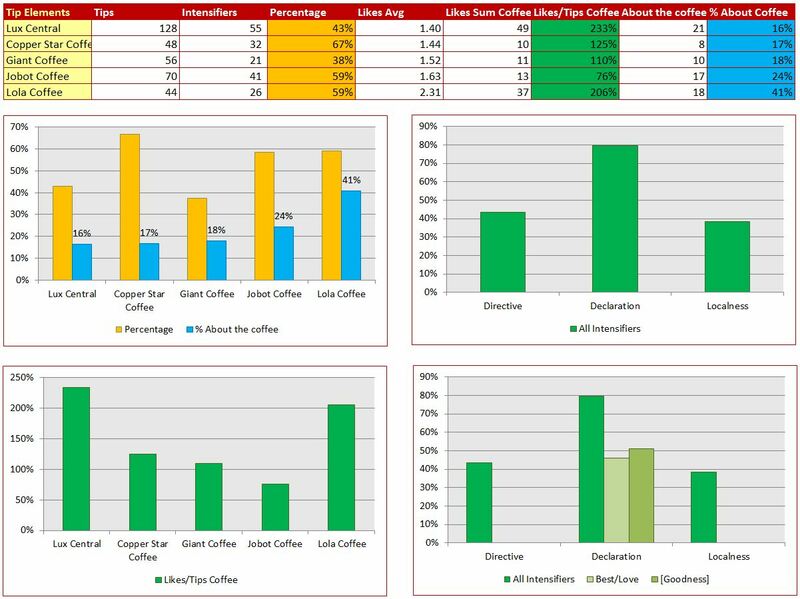 To compare the above chart data against the data for the other coffeehouses, click here. Click image to enlarge.